It was with great excitement that I boarded the plane on the 2nd of December to fly the 3,000 miles to New Orleans, Louisiana to present at the 13th Biennial Getting In Touch With Literacy Conference 2017. The conference was extremely well attended, with approximately 400 teachers of children and young people with vision impairment (VI) from across the USA, with a smaller contingency attending from Germany, Sweden and the UK. The conference featured over 70 concurrent sessions across a range of literacy topics, focussing on children and young people with VI. Further features of the conference included an awards brunch, auction and poster sessions. One of those 70 sessions to be presented was by Positive Eye. The theme for my workshop was the ‘Marketness of the market place’. In honour of the conference, I wrote a story and designed a character called Marvin, who would help me to present the rich learning opportunities available within a market place, such as smelling the different scented flowers at a flower stall or exploring the vegetables and fruit at another. Sighted children develop and gain knowledge and experience through incidental learning. During their first few years of life, they have exposure to a vast range of visual symbols that convey meaning. This access to the literate environment doesn’t occur naturally for a child with VI. Our goal is to expose the child systematically and as early and often as possible to a rich variety of concrete experiences, involving many objects, people, places, and activities. Building this solid foundation of reading readiness skills and fun experiences from infancy is critical. Using a theme-based approach during the emergent stages of literacy development enables us to offer a multitude of rich literacy learning opportunities. My story, ‘Marvin’s Market Adventure and Grandma’s Special Birthday Picnic’, was written to support this theme-based approach. Maxing out my luggage restrictions enabled transportation of many fun and colourful resources ready to be presented in a lively, practical session on the first day of the conference. Marvin broke the ice, made friends and our workshop was extremely popular. We shared resources and ideas to support numeracy, literacy, science, social and emotional wellbeing, identifying ways in which the child’s emergent literacy skills could be enhanced and developed. I was even asked to do a second presentation when another speaker was unable to attend their scheduled session. This second outing for Marvin took place in one of the hotel lobbies as a pop up session and proved to be incredibly popular with delegates, people walking past also stopped to join in with the original attendees. 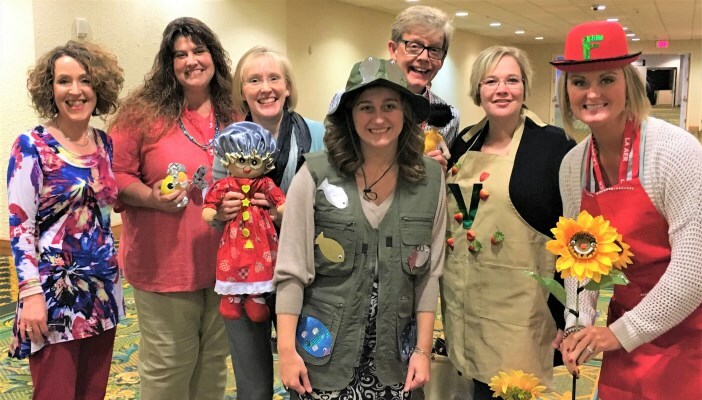 At the end of this session, many people remained for over an hour discussing ideas, resources and even dressing up as characters from the story for group photos (pictured are the tutors and teachers from the University of Kentucky Teacher of VI programme). With so many sessions to choose between, the decision as to which workshops to attend was tricky! Highlights included Dr Carrice Cummins words and thoughts in her opening keynote address ‘Teachers and the T’s of Today’s Literacy Teaching Practices’, where she explored effective literacy teaching from the perspective of current best practices. Talking: Talking facilitates thinking which activates connections, and utilises reading strategies that require talking of retelling stories and of holding grand conversations. Time: Allow quality time to engage in the reading process and time to linger to get to grips with issues raised within texts. Texts: Texts expose children to a wide variety of types and levels of text. Dr Cummins’ finishing note reminded us that thinking is common to all three strands of talk, time and text, and that we must teach the child to think their way through the text. Another highlight was ‘ABCs and 123s of Early Literacy for Young Visually Impaired Children,’ by Karen and Kate Borg from Utah Schools for the Deaf and Blind. This session reinforced my philosophy of breaking down concepts into small steps. It also discussed the need for extensive and repeated experience with real objects and the importance of the hands on approach of that experience occurring as far as possible within a natural context and environment. ‘Communication Strategies for Students with Complex Needs Including Teaching Core Vocabulary’ was a lively enthusiastic presentation by two technology experts. They highlighted a range of useful tools and resources for assisting professionals in developing systems of communication that emphasise core vocabulary for this population. Tools for access included Functional Vision and Learning Media Assessment, Cortical Visual Impairment (CVI) Range by Roman-Lantzy (2007), and Augmentative Communication Evaluation Simplified (ACES). Tools for communication included Every Move Counts, Communication Matrix and Functional Communication Profile. This conference is a wonderful, vibrant and interactive three days spent with like-minded professionals, sharing ideas, resources, approaches and most importantly a love of supporting children and young people with vision impairment to experience literacy beyond the written word.